Do you know minimum how much does a DeWalt Sticker cost? Its about $300 – yes that’s correct. The manufacturer behind DeWalt pressure washers is Simpson. DeWalt is just branding their product and helping Simpson to earn royalties. Don’t be surprise if I say Black & Decker is also doing the same. 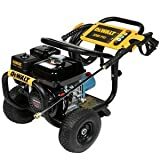 Basically Simpson manufacture pressure washers at their Decatur, Arkansas plant and later rebadge them as DeWalt hence both companies are making some handsome profit. This is not first time that DeWalt has used some other company’s product, they have been selling DeWalt ladders which were originally built by Louisville Ladder, Inc and DeWalt heaters were actually made by HeatStar. We can’t blame DeWalt because if it makes money then it makes sense. But DeWalt is not giving away their name like that, for a product to earn DeWalt name it has to be top class, durable and massive performance player. And in many cases products having DeWalt name is selling more expensive rather than original manufacture brand. This is undoubtedly the best pressure washer by DeWalt till-date. First of all it is very much reasonably priced so that it become obvious choice of most of us. Secondly this direct-dive cold water gas unit has power of 3200 PSI which is quite sufficient for performing heavy-duty tasks. CAT Triples Pump is the main distinguished feature along with Honda GX200 powerful engine to ensure long lasting operation and super durability. The above mentioned combination of CAT Triplex and Honda Engine surely makes this product to be quite sturdy, heavy-duty and extreme performer. Those people who believes in DeWalt brand can go for this washer with closed eyes. Considering the fact that this unit is equipped with Honda GX200 engine thus makes its noise level a bit high. Because Honda GX200 is a commercial engine producing much power, hence high noise level is obvious. As described above, DeWalt products are relatively expensive as compare to other peer. But the quality they offer surely makes sense for higher price tags. In order to qualify for warranty you need to strictly follow the maintenance as per user manual. 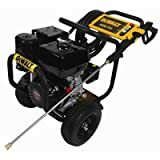 If you are looking for some extensive heavy-duty tasks to perform, then DeWalt 4200PSI pressure washer would be best fit for your. Powered with Honda GX390 commercial engine with 4200 PSI, this pressure washer is sufficient enough to blow off any stains or even peel of older paint. CAT frame with steel structure ensures the durability for over the time and quick connect nozzles allows you to clean almost any type of surface. Big inflated tires makes sure that you can carry this beast from one place to other without any hassle and from security point of view different alert systems are there to help you for any possible misuse, such as oil alert to prevent engine.